The easiest way to make your own Bijlmer Euro is to come along to one of the Money Making Workshops we will hosting at Imagine IC where we will provide you with all the materials for making your own notes. The dates for these will be advertised on this website. You will need to collect some disposable Dutch OV travel cards from Amsterdam. If you have a look around the metro stations or tram stop you usually see a whole bunch of them lying around. Try and get some of the straight ones that have not been damaged. Dirty doesn’t matter but broken antenna is bad. Take one of the OV cards and drop it into some Acetone which you can buy from any pharmacy. 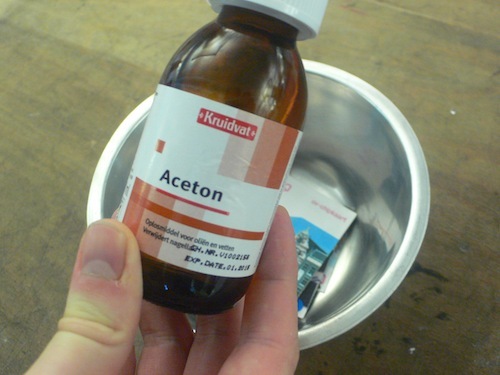 Warning, Acetone is not good for you! 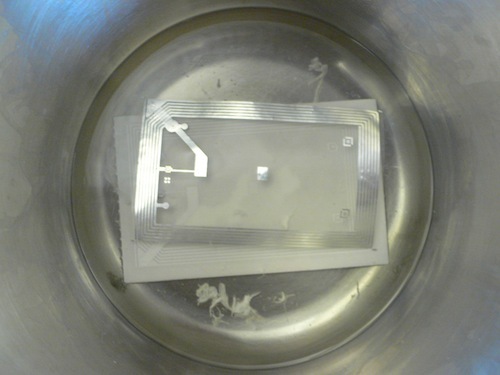 Wait for about 15 minutes for the to cardboard sections to fall off and the shiny clean RFID tag will emerge. This tag is a Mifare Ultralight tag, which is technically identical to the one used for the Bijlmer Euro. What is nice is that these tags are unencrypted and can easily be re-programmed. We are just using the UID the unique ID. 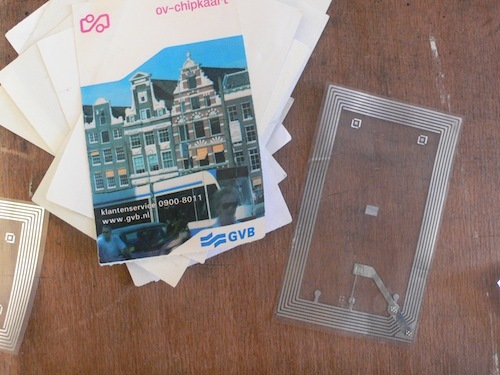 To turn this RFID tag into a Bijlmer Euro you need to download the logo PDF on this page, and print it onto a sheet of transparent sticker paper. Then cut them out and stick on top of the the tag. Finally you have to spray mount the sticker onto your normal note of five or ten Euros. Only use temporary spray-mount, and don’t use too much of it! Be Careful: Your Euro note and thus your Bijlmer Euro will lose its value if the tag cannot be taken off the note without trace. When you are done you can go and claim your discount at any of the participating shops – happy in the knowledge that you have added some more money to the Bijlmer Euro circulation. Well Done!